Local emergency management services are asking motorists to stay clear of US 6 in west Glenwood to allow first responders to get through. 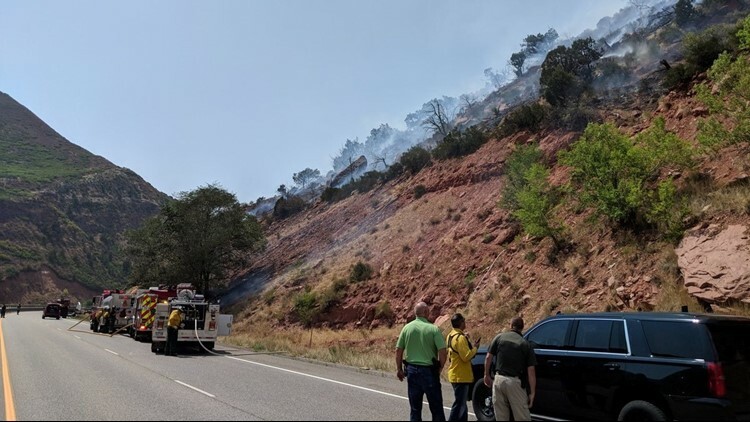 KUSA — One lane of Interstate 70 westbound is open west of Glenwood Springs after a wildfire sparked in the area, the Colorado Department of Transportation tweeted on Wednesday afternoon. According to CDOT, the closure happened at the South Canyon exit in Garfield County. The fire, according to the Garfield County Sheriff's Office, was first reported around 2:30 p.m. and quickly spread up the slope on the north side of I-70, burning in trees and brush. A helicopter is doing water drops. Rafters planning to enter the river from the 114 East and travel through the South Canyon area need to cancel those plans, the sheriff's office said in a release, because it's impossible to continue aerial helicopter water drops from the river if there are rafts or other watercraft in the river. One lane of I-70 westbound is open at milemarker 114. The eastbound lanes were closed at milemarker 109 for about an hour. Residents in the Ami's Acres and Mitchell Creek areas were briefly on a pre-evacuation notice, meaning they should be ready to leave at a moment's notice. PRE-EVACUATION NOTICE- Amy's Acres and Mitchell Creek Areas. Drivers are urged to take an alternate route and check cotrip.org for updates. Glenwood Springs is about 150 miles west of Denver.